South Iceland is the region of Iceland along the North Atlantic Ocean. Towns are listed in a west-east order. Hveragerði - located in a geothermal area, less than an hour from Reykjavík by car. Eyrarbakki - beautiful old village on the south coast. Also worth visiting are nearby Stokkseyri and Þorlákshöfn. Selfoss - the largest town in the south. Hella and Hvolsvöllur - two nearby villages in the agricultural heartland of western South Iceland. Vestmannaeyjar is the name for both a town and an archipelago just south of Iceland. Vík - a coastal village world famous for its puffins, black sand beaches, impressive basalt columns and strange rock formations in the ocean. Kirkjubæjarklaustur - a village in the sparsely populated Skaftárhreppur, in the eastern part of South Iceland. Þingvellir National Park (pronounced "THINGK-vet-lihr") - National Park and a UNESCO World Heritage site. 30 to 50 km (20 - 30 mi) east of Reykjavík. Interesting for a number of reasons. This is not only the original site of the longest running parliament in the world (the name literally means parliamentary fields), but it's a place where you can see the North-American and European continental shelf plates are being torn apart. Upcountry Árnessýsla - A rural area in the north-western corner of South Iceland. Home to some of the most famous tourist destinations in Iceland including Gullfoss and Geysir. Landmannalaugar - One of the great jewels of Iceland, located in the Southern Highlands is Landmannalaugar. The area's incredible natural beauty and extreme contrasts have been attracting visitors for centuries. It's a mountainous area rich in minerals, which results in strong colors, and it's impressive volcanic geology brings you to massive, old lava fields and natural hot springs. There's a mountain hut operated by Ferðafélag Íslands , and a simple, rocky camp ground is there as well. There is a simple mountain shop/café where snacks and coffee can be bought, as well as fishing license to the nearby lakes, where you can catch mountain trout. There is also one horse rental operated by Hraunhestar, ranging from 2 to 10 hours in length through the spectacular valleys and many marked hiking trails, one leading all the way south to Þórsmörk. Vatnajökull National Park - This large national park, covering the entire glacier of Vatnajökull as well as some of its surroundings, reaches into three different regions of Iceland. The glacier itself is most easily accessible in the south, with the service centre and campsite at Skaftafell lying just off the ring road. Þórsmörk - A natural pearl situated in a valley, tucked in between two glaciers. There are many hiking opportunities in the area, with its large network of marked trails. There is a lovely camp ground and several mountain cabins and little bungalows. Road access is by four-wheel-drive routes (F-roads) only. Heimaey - An island in the Vestmannaeyjar archipelago known for it's 1973 volcanic eruption that destroyed part of the town Vestmannaeyjar and for the Atlantic puffin colonies. Millions of birds spend summer and breed in the island's cliffs. It is possible to visit Heimaey as a day trip from Reykjavik. South Iceland's charm lies in its many large and impressive waterfalls and glaciers, unique geology and fascinating medieval history. The eastern part of South Iceland is dominated by the glacier Vatnajökull and the water systems linked to it. Big rivers flow from the glacier in all directions and have created large flood planes along the southern coast. The glacier itself as well as some of the surrounding areas form Vatnajökull National Park, the biggest national park in Iceland. Uniquely for Iceland, the south is not a fishing area. This is because it has practically no natural harbours. In fact the southern coastline from Þorlákshöfn in the west to Höfn in the east contains an almost unbroken sand beach open directly to the treacherous Atlantic Ocean. Taking the ring road east from Reykjavík will very quickly lead you into South Iceland. This is how by far most locals will choose to travel and as with the rest of Iceland, having a car of your own will give you a lot more options for exploring the region than relying on public transport. When entering from Reykjavík, you also have the alternative of taking the road through Þingvellir to enter South Iceland. Drive up on the ring road through Mosfellsbær (a town on the outskirts of Reykjavík), as if you were heading for West Iceland, and following the signs indicating Þingvellir (road nr. 36). If you're entering the country by ferry and bringing your own car, you will drive off the ferry in Seyðisfjörður in East Iceland. Once you get to the ring road, head southwards and you should be able to reach South Iceland in a few hours. It may be best, though, to stop somewhere around Höfn in the southeast before heading further, as the distances are big. Mainland South Iceland itself is not served by any flights, domestic or international. On the western side, it's within reach of Reykjavík, which has a domestic airport that connects with some of the towns in different parts of the country. The eastern half of South Iceland can be reached by flying from Reykjavík to Höfn (a town in the southeast) with Eagle Air . This is close to Vatnajökull National Park, Jökulsárlón and other popular destinations. Vestmannaeyjar have a domestic airport, with flights from Reykjavík with Eagle Air. Scheduled buses run along most of South Iceland operated by Sterna . 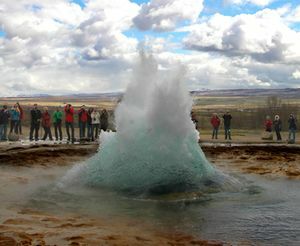 Reykjavík Excursions  also has some scheduled services and a number of guided tours. The Reykjavík area bus system (Strætó ) reaches all the way to Selfoss. Take bus nr. 51 from Mjódd, which goes over Hellisheiði to the town of Hveragerði and then terminates in Selfoss. The south is well served by the ring road, which goes right through the region from west to east serving most of the population centres on the way. The western part of the south is one of few regions in Iceland where populated areas are found far inland, and this area has a good road system as well. Further east the interior turns into highlands and glaciers, and should only be reached by 4x4s. As in the rest of Iceland, public transport can be quite difficult to navigate and cannot take you everywhere. However the bus system is slightly more developed in the south and there is a bus that travels daily along the entire southern section of the ring road. There are also buses that travel between the upcountry towns in the western part of the south. Most of these are operated by Sterna  or Reykjavík Excursions , but it may also be worth it to ask around locally as there may be different seasonal options. A ferry called Herjólfur, operated by Eimskip , runs between the mainland and Vestmannaeyjar. Recently a new harbour was created in Landeyjar, shortening sailing times significantly, but as it frequently fills with sand the old harbour at Þorlákshöfn is also in use. Add to this the fact that high waves often occur on the route and you get very irregular travel times, so it's best to check the status of the ferry before showing up at the pier! If you're traveling by car, it can also be brought to the islands with the ferry. 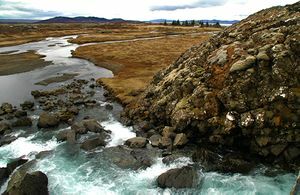 Þingvellir - this is the most popular national park in Iceland and a UNESCO World Heritage site. It includes a valley that is mentioned in many famous Icelandic sagas and is where one of the oldest parliamentary institutions of the world, the Althing, was founded in the year 930. This is also where tectonic activity can be clearly seen as the continental drift has identified and scarred this area for millions of years. 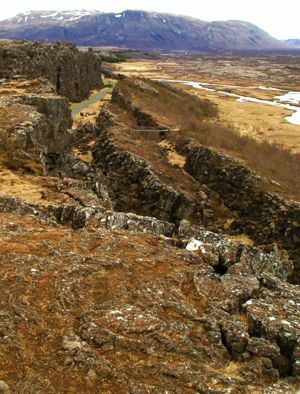 The Þingvellir valley is an older portion of the Mid Atlantic Ridge that is becoming extinct. However, it is still spreading apart at the rate of a quarter-inch per year. This means that the visitor center, perched on the edge of the North American plate with a view of the valley where the Öxará River flows, is moving west, away from the Eurasian plate on the east side of the valley. The valley floor has been dropping by 1.6 inches every century, having dropped a total of 230 feet during the last 100,000 years. Many visitors walk through the smaller Almannagjá rift, that runs along the west edge of the valley, which itself is spreading apart at the faster rate of 0.8 inches per year. Geysir - the hot spring that is the namesake for all geysers in the world, is also one of the most popular stops in Iceland. First stories of the Geysir area can be found in documents from the year 1294 when earthquakes were frequent in the southern part of Iceland and caused the area to evolve to its current form. In the year 1630 the geysers in the area had so much power that the earth trembled when they spouted. As with many of the natural features in Iceland, many will be amazed at how close you can get to the geysers. Access is very unrestricted, you are not held behind guard rails and no officials warn you off. It is exhilarating to be able to be so close, and refreshing to be treated as an adult. Here's hoping trial lawyers never discover Iceland. As well as Geysir itself, which seldom erupts, there is the five-minutely Strokkur, other geysers, and various strikingly coloured hot pools. There is free parking, a gift shop and a good cafe. Admission 600 ISK. Gullfoss (Golden Falls) - a magnificent 32m high double waterfall on the White River (Hvítá). The flow of the river from the regular rains and the glacial runoff, particularly in summer, makes it the largest volume falls in Europe. Numerous tours take you along a Golden Circle that includes Gullfoss. Free parking, gift shop, and cafe. 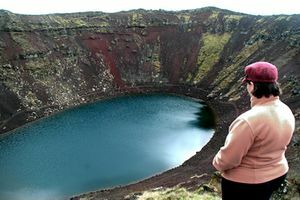 Kerið - a small volcanic crater on Route 35, about 12 km north of the ring road. (Kerið lies conveniently on the route back toward Reykjavik from Gullfoss.) There is a small car park, and visitors can walk up to the rim in a matter of seconds, do a circuit of the rim in fifteen minutes, or easily walk down into the bowl on an obvious path. In winter it may be possible to walk out part-way onto the frozen ice of the crater lake. An easy volcano to get up close and personal with! Admission 400 ISK. Urridafoss waterfall - on the Þjórsá River, Iceland's longest river, has the second-greatest flow of water in Iceland. It is said the salmon in this river have an exceptionally strong and long tailfin in order to clear the 20-foot high waterfall. Directions: turn right off Hwy #1 on a gravel road just before the Þjórsá River, go about 1 km, and turn left on the access road just after passing a farm on the right and crossing a stream. 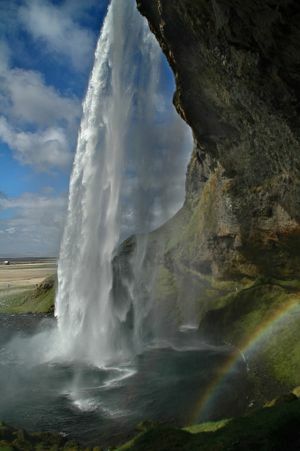 Seljalandsfoss - one of South Iceland's many falls, falling off a 60 m high cliff. It's biggest attraction is the pathway leading to behind the falls. Access to the falls is free and open year round. Walk about 600 m on the gravel path north from Seljalandsfoss to see the Gljúfrabúi waterfall hidden behind a giant boulder. There are no services at the falls, besides a picnic table and a public bathroom. Skógar - a small village home to the mighty and beautiful Skógafoss waterfall and one of Iceland's most famous museums, Skogar Folk Museum. 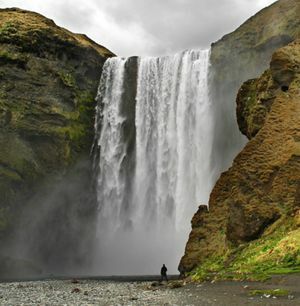 Skógafoss is 60 m tall and 25 m wide and comes from the river of Skógá. The falls have been protected since 1987. Access to the falls is open all year round and there is no admission. A trail leads to the top of the falls (via metal stairs to the right of the waterfall) and up the Skógá river valley. This trail eventually ascends all the way to the Fimmvörðuháls pass between the Eyjafjallajökull and Mýrdalsjökull glaciers before descending to Þórsmörk; the complete hike from Skógar to Þórsmörk generally takes two days. Day hikers can follow this trail as far as they like along the Skógá river, they will be rewarded with views of more than a dozen waterfalls. Skogar Folk Museum houses a large collection of antique and historical artifacts. The museum is stretched over a large area, with 13 houses standing on the museum grounds. The museum is open June to August from 09:00 to 18:30, May and September from 10:00 to 17:00 and the rest of the year from 11:00 to 16:00. Entrance is 1,000 ISK for adults, 600 ISK for students, seniors and children aged 12-15. Free for children under 12 if accompanied by an adult. There are several services in town, including restaurants and accommodation. Dyrhólaey peninsula - is a nature reserve at the southern-most point of Iceland, with puffins nesting on the cliffs, and a shallow inland lagoon full of wading birds. There are a couple of large sea arches in the cliffs near the point. To the east, you can see the black lava sea stacks of Reynisdrangar. Turn right from the Ring Road onto Rt. 218. Parts of the reserve are off-limits in May and June for bird-nesting, check locally for exact dates and conditions. Reynisfjara beach - Black volcanic sands become black and grey oval and round rocks as you walk over to the "organ pipe" basalt columns at the Hálsanefshellir sea cave. You can't reach the cave at high tide (check tidal times with Icelandic Hydrographic Service, tel. 545-2000, or check Vegagerðin's forecast for the area online). The beach extends 1.5 miles from Reynisfjall to Dýrholaey, providing a barrier that creates the Dyrhólaós Lagoon. Turn right off the Ring Road on Rt. 215 just before you climb the around the last mountain, heading east, before you drop into the small town of Vik. 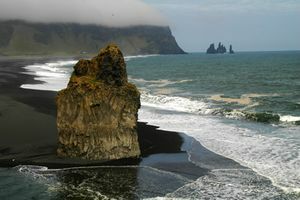 Vik - this village's beautiful black sand beach provides good views of the Reynisdrangar sea stacks. It is the wettest coastal town in Iceland, getting 7.5 feet of rain annually. There are a half dozen good dining options in Vik including the Hotel Lundi Restaurant, Halldorskaffi, and the Strondin Bistro and Bar. Skaftárhraun - to the west of Kirkjubæjarklaustur, is one of the world's largest lava plains, covering 4,500 square miles. 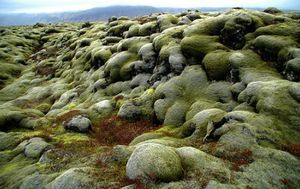 Despite being covered with moss, it is largely uninhabitable. It was created by an 8-month-long eruption that began in 1783 and produced 3-and-1/3 cubic miles of lava. The eruption and its aftermath dried up several rivers and killed about 25% of the population and 70% of the horses in Iceland. The bad weather it created that probaby helped trigger the French Revolution, and caused the the Mississippi River to freeze in New Orleans and produced ice in the Gulf of Mexico. Kirkjugólf - (literally: Church Floor) is an interesting rock formation to the east of Kirkjubæjarklaustur, flat basalt columns that look almost like a man made floor. A Golden Circle tour generally includes – at a minimum – Geysir, Gullfoss, and Þingvellir. Various companies offer day coach tours, or a better alternative is to rent a car for a day; this will let you see many more sights and often save money, especially if you have 2 or more people in your group. This also lets you vary the time you want at each attraction, linger at the geysers, or have a stop at Kerið. Fimmvörðuháls – a popular hiking trail, from Skógar to Þórsmörk, between Mýrdalsjökull and Eyjafjallajökull. Eyjafjallajökull famously erupted in 2010 sending an ash cloud across Europe, but shortly before that eruption Fimmvörðuháls itself erupted, causing the trail to be closed for a while. It is now completely safe once more, and with the added attraction of seeing brand new landscapes. Laugavegurinn – another popular hiking trail from Landmannalaugar to Þórsmörk, 55 km long, with huts on the way where you can stay overnight. Each summer the trail is host to a cross-country marathon called the Laugavegur Ultra Marathon is held on the route. Not to be confused with the shopping street of the same name in Reykjavík! It is possible is to do hike Laugavegurinn and Fimmvörðuháls together, as they both lead to Þórsmörk. River rafting is possible in both Hvítá and Markarfljót, close to Selfoss and Hvolsvöllur respectively. Glacier tours – traveling with specially equipped trucks onto Vatnajökull offers incredible views of the white desert that is Europe's largest glacier. The western part of South Iceland is in many ways Iceland's agricultural heartland, and hosts many traditional Icelandic farms with sheep, cattle, horses, and other animals. It's one of the main dairy producing regions of the country, producing most of the milk consumed in the capital region. Further east, aquaculture and fresh-water fishing plays an important role. Arctic char from Kirkjubæjarklaustur is known in Iceland as a delicacy. Also worth mentioning is the farm Þorvaldseyri , the only place where wheat is grown in Iceland. You can buy it straight from the farmer. Awareness of the value of local produce is increasing, and farmers markets are becoming ever more common in South Iceland. You should also ask in restaurants whether they have some local specialties, chances are that they do. There isn't much in the way of nightlife in South Iceland outside the main towns. Of the towns it should be no surprise that Selfoss, being the largest town in the region, has the most active nightlife. South Iceland is home to one of Iceland's smaller breweries, called Ölvisholt Brugghús. It's located in a rural area about 10km outside Selfoss and their three main beers are called Skjálfti, Freyja and Móri. The major concern for safety in South Iceland are the roads. The roads leading inland from Selfoss are very narrow and drivers should take special precaution. The national road from Reykjavík to Hveragerði, a mountain pass called Hellisheiði, can be particularly dangerous in winter, as blinding snow storms, icy roads and strong wind is common. As the southern coast is open directly to the Atlantic Ocean, it's important to be very careful when on the beach. Appearances can be deceiving, and tides can be strong. Tourists have been killed when suddenly swept out to sea by what is called a "Sneaker Wave". Continuing east out of South Iceland will bring you to East Iceland, with the stunning East Fjords. To the west is Southwest Iceland including the vibrant capital Reykjavík and the international airport in Keflavík. Alternatively you could choose to head towards the Interior, the expansive highland region which can only be accessed in 4x4s but offers some incredible rugged landscapes. You could cross via Kjölur or Sprengisandsleið and reach North Iceland on the other side of the island, but for this you need to be very well equipped and do good research on both road conditions and weather before setting off. This page was last edited on 19 September 2018, at 12:36.